Gaia Herbs mixes two great species of ginseng in their Ginseng Supreme liquid supplement. Notes: Ecologically harvested. 100% vegan. Free of pesticide and heavy-metal toxicity. Tested for potency. 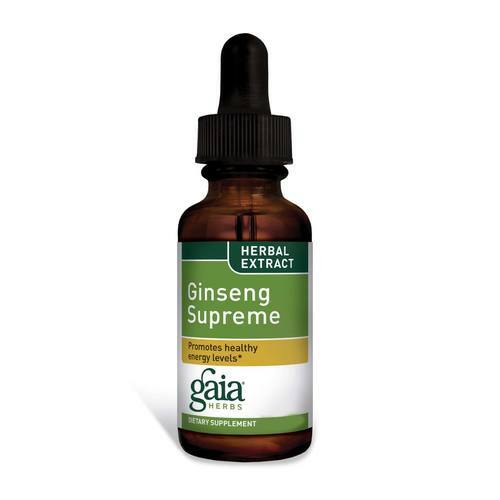 The customer reviews posted below are based on individual consumer experiences and may NOT necessarily represent what expected results will be from using or taking Gaia Herbs Ginseng Supreme - 4 fl oz. These results may not be typical and you should not necessarily expect to receive the same results. Actual results may vary. I love this product, because you can feel it working into your system, these herbal blend is energy filled.